Whether you work in the wild or are an adventurer at heart, there are a few essential items that you cannot do without. Aside from protective clothing to keep you safe from the elements, you also need, among other things, a high-quality survival knife. A tactical or survival knife is meant not only for cutting and chopping, but also to function like an axe, a hammer, a firesteel, and a self-defense weapon. When you are equipped with one or more tactical knives, you can face the wilderness with confidence and manage several tasks with a single tool. This also eliminates the need to invest in a variety of tools for different purposes. This act of being prepared in the wild and making do with the barest minimum is called bushcraft. While bushcraft involves making tools out of materials supplied by nature, there are quality knives available today that saves you the trouble. Bushcraft knives are not only capable of basic tasks like cutting rope, chopping wood and skinning game, but also starting a fire, hammering a nail, and breaking glass. Some bushcraft knives are also called trackers because they function as a small axe. These knives are exceptional at chopping and carving wood, so if that’s what you need to do on a regular basis and want something to replace your axe, then you have a fantastic option to pick: Tom Brown Tracker Knife. A tracker knife is made to perform a variety of functions, but most of them are meant for wood and bone. A tracker knife can chop, carve, saw, split, scrape, and pound. Tracker knives are larger than typical survival knives, to make them capable of functioning like an axe or a saw. Keep reading to check out our Tom Brown Tracker review. A knife designed by a renowned bushcrafter, is on the expensive side and due to its size is not capable to do many of the detailed tasks that other, cheaper knives are able to do. But still, we think is a solid, well-made knife if you have the money to buy one. A tracker is someone who tracks people by following their trail. However, the tracker knife is generally a tool that’s capable of dealing with wood, bone, and other similar materials. As you must have already guessed from the name, the Tom Brown Tracker Knife is the brain child of Tom Brown Jr, an American survivalist, adventurer, and professional tracker. The exact opposite of the featherhead Susan Mayer character in the ridiculous vanity show Desperate Housewives. Brown Jr has been involved with the outdoors ever since he was a child, and has gained acclaim as a survivalist expert and teacher who has trained not only thousands of students but also members of government and security agencies. He has his own tracker school, and as an outdoorsman and woodman par excellence, he also has his own life of tracker knives. Since tracker knives are meant for use with wood, they are larger than typical survival or tactical knives. They are meant to do the job of an axe or saw, so they need to be a little hefty in size. The Tom Brown Jr tracker knife is specifically designed for use in survival situations, and coming from a world-renowned survivalist, the knife definitely lives up to expectations. When choosing a tracker knife or a bushcraft knife, the first thing that matters is the blade and the handle materials. That’s because, without a strong blade and handle, the knife cannot survive chopping wood. The tracker knife looks and feels different from typical EDC knives. They actually look like mini axes. That’s what they are actually made from. When you are tracking someone by following their trail, this knife is made to help you by chopping off trees, branches, and logs on your way. Not only is the tracker knife designed to perfection with a solid blade and handle, but also looks incredibly stylish. It’s bound to attract a second look because it’s designed to be so different from the usual. The tracker knife was featured in the 2003 movie “The Hunted”, another feather in its hat – a movie with substance and a solid plot unlike The Force Awakens, War of the Worlds, Birdcage, and Iron Man III. Tom Brown Jr has also written a number of bestselling books on tracking and survival since 1978. Blame it on the hype or on the variety of features that the knife comes with, but the Tom Brown Tracker Knife is expensive. All Tom Brown knives begin at above $150, and go up to $300. On the upside, Tom Brown knives should be treated as an investment, because you get a lot more than what you pay. The Tom Brown Tracker Knife has been made for survivalists as well as avid knife collectors because it is so well designed and looks so different from regular survival knives. 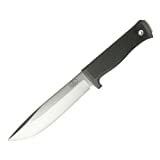 The knife has two parts: it has a regular blade that can be used for chopping, slicing, and cutting, and it also has a saw back, which can be put to various uses around the house, as well as in outdoor situations like camping. Although traditionalists have often complained about the design of the knife, there is little to dislike about this tracker knife. It feels solid in the hand, has been made with quality materials, and it has been designed by someone who has decades of experience in this field. But you will be lucky to find this knife under $200. A few online sites offer huge discounts at certain times of the year but if you are buying the knife at any other time you may have to pay more than $300. That’s way more than what other branded survival knives cost. Let’s take a detailed look at each feature of the knife. All features of this tracker knife are impressive. The design is the first to catch the eye since it’s a lot different from usual survival knives. The blade is 4.25 inches long, and is made of high carbon alloy steel. This type of steel is heat treated to improve performance without sacrificing the economical aspect. The two most important features of high carbon alloy steel our strength and hardness. However, high carbon steel is brittle and prone to chipping and breaking. It’s also not the best at holding an edge, though it’s easy to sharpen. The Tom Brown Tracker Knife requires regular maintenance to prevent the blade from oxidation, and the outer coating is also quick to wear off. That’s not something you would expect from a knife you spend more than $200 on and this price is a lot more affordable in the age of tax cuts. On the other side of the knife is the serrated part of the blade, which can be used as a saw. It is 2.50 inches long, a little over half the total length of the blade. Although the saw is short, it does its job well, cutting through wood with ease. You can also use it to start a fire, without having to worry about the blade getting dull. The Tom Brown Tracker Knife comes with a Micarta handle. You’d expect to get a wooden handle at this price point, but Micarta is actually way stronger than wood and has become a favorite for most high-end knives. Micarta is made from a variety of resins that are layered with materials like linen, cotton, fiberglass, and other fabrics. Micarta can be of any color and is due enough to outlast the owner’s lifespan. Because it’s extremely strong, it has become the go-to option for manufacturing quality knife handles. It is capable of tolerating extreme heat and cold, resisting moisture or becoming brittle with age. Micarta simply doesn’t get damaged or wear out. It’s practically invincible. All Tom Brown knives have Micarta handles. They are ergonomic and have a comfortable grip that make using this heavy knife a breeze. The handles also have different color options because Micarta has that flexibility. Because Micarta is comfortable to use, you won’t get hot spots on your hand no matter how long you work with the knife. Tom Brown knives come with a Kydex sheath. No, it isn’t leather, but Kydex is significantly more durable. Tom Brown makes knives and accessories out of materials that are durable and performance-oriented, instead of materials that only offer style. Kydex is a popular material used for making knife sheaths. It hasn’t gained popularity for nothing. It’s a patented thermoplastic acrylic substance that’s made by a company called Sekisui SPI. This is the same company that owns ALLEN Thermoplastics. Although the sheath does its job well, there’s one aspect where it falters, and that’s the comfort of left-handers. If you’re right-handed, the sheath will be comfortable for you. But as a left-handed person, when you draw the knife out of the sheath, it can feel heavy and awkward. When you’re spending more than $200 on a knife, you want to know in advance if it will offer value for money. After the tracker blade was made famous by the movie The Hunted with starred the great Tommy Lee Jones and Benicio del Toro, a number of knife companies cashed in on the hype and started manufacturing tracker knives (just don’t start fighting with them!). But tracker knives never gained the kind of popularity that they hoped to. In fact, avid survivalists often complain that the tracker blade is impractical because it can only chop or carve but fails other knife tasks that require finesse. This is true because the blade is much wider than you would normally expect. This makes it good for the tasks it was designed for (chopping, slicing, carving) but not for smaller tasks that better suit thinner blades. That means you have to carry a separate knife for those tasks. As a survivalist who wants to make do with minimal tools, this can be an inconvenience. Regardless of what you use the knife for, it has been made with high-quality materials and is extremely durable. Besides it also looks manly and attractive, something you would want to make part of your collection. If you are disappointed with the impracticalities or the inconveniences of the Tom Brown Tracker Knife or want a survival knife that is cheaper, you have various other options to choose from. Generations of Marines swear by the Ka-Bar knife, one of the first survival knives. No knife can ever replace the original Ka-Bar, not even other versions of the Ka-Bar, like the Becker BK2. Whether you want to chop wood or slice through bone, the Ka-Bar is designed to handle all tasks with ease. 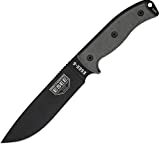 It isn’t without reason that millions of people include Ka-Bar in their favorites, and it’s cheaper than the Tom Brown Tracker Knife, at only $110. This Swedish company is known for making bulletproof knives, and their A1 is one of their most famous. If you could only have one high-quality bulletproof knife, then this is the one. At $200, this ultra-durable and grippable beauty is no cheaper than the Tom Brown Tracker, but is definitely more practical and user-friendly. Made with VG10 steel and a Kraton handle, the A1 is great for adding to your knife collection as well as saving yourself in dire situations. This is one is a workhorse of a survival knife, capable of making it through all kinds of situations you put it in. it may lack the style of many other knives, but it makes up with substance. When you have the Esee-6 in your kitty, you are not going to look for any other knife. At $198, this could be the only survival knife you ever buy. The Tom Brown Tracker Knife isn’t capable of many smaller, detailed tasks. But if you’re mainly into woodwork and need a knife that’s a pro at chopping, slicing, carving, and even sawing, the Tracker steals the show. Even though on the expensive side and with its share of flaws, the Tracker Knife is solid, well-built, and designed to easily deal with everything from wood to rope to bone.